In May last year, I travelled on the "Mendip Meanderer" railtour organised by Black Eight Railtours. For their May Day Bank Holiday tour this year, a trip from Birmingham to Quainton Road was advertised, followed by a run via Bletchley, Bedford, Corby, Melton Mowbray and back to Birmingham. As this seemed a most interesting itinerary, I booked for myself and a friend. However, a few weeks before the trip, a letter arrived announcing a change of plan. Network South East, bless them, had decided to close the Bedford - Bletchley line for the Bank Holiday. The result was a revised route, the "Brickfield Rambler" almost completely avoiding the brickfields! We joined our train at New Street, Platform 12. Like my earlier trip in March, it consisted of the GWR liveried Pressed Steel class 117 3-car suburban unit. I had requested on booking that we had non-smoking seats in an unpowered car if possible, and we duly took our position in the centre car of the unit. At 8.45, precisely on time, we pulled out to take the route via St. Andrews Junction to Tyseley. After a brief pause to pick up, we then headed away down the Stratford line, picking up again en route at Henley-in-Arden, under threat of becoming the terminus of this route to Stratford. Reversing at Stratford, we took the single track route to Leamington, then headed down the former GWR main line to Princes Risborough, pausing on the way for the final pick up at Banbury. Sadly we were now 12 minutes late, having been held up near Fenny Compton for no readily apparent reason. Reversal now took us to Aylesbury, terminus of services up the GCR routes from Marylebone, then on up the former GCR main line, now freight only, to Quainton Road. We were to stop here, though the route continues as far as Claydon LNE Junction on the Oxford - Bletchley Line, and is used by some freight and empty stock from Aylesbury to Bletchley. Easy scheduling on the freight only stretch meant we had arrived just 5 minutes late, and so had most of the promised hour and a half to look round. Quainton Road used to be best known for its large collection of industrial locomotives, but is becoming better known now for its main line stock, particularly with the reassembly of 6024 King Edward I. I was very pleased to find in steam on this occasion the Metropolitan Railway 0-4-4T, somewhat different from the usual preserved engine. 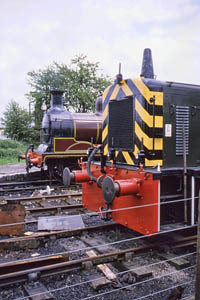 This was operating a passenger service (one coach and a brake van) on the western half of the site. On the eastern side a pannier tank (I suppose it must have been 7715, but I can't say I remember!) was doing the same thing with a three coach train. We left Quainton Road at 1.03pm, and headed south for Marylebone, taking the direct route via Amersham, where we gained the company of the underground for the journey to the centre of London, at any rate as far as Lords tunnel. We had about 35 minutes at Marylebone, so I took the opportunity to get a few photographs, this being my first visit to the station. Redecoration was in progress in the main part of the train shed, with the usual NSE tendency for the vertical parts to turn red! Our route now became rather interesting, as we somehow had to gain the GWR main line to Didcot. This was achieved by taking the former GWR and GCR joint route to West Ruislip, then reversing via Northolt and Greenford to Drayton Green Junction, there gaining the main line. Timekeeping had been impeccable since leaving Quainton - we were in fact 3 minutes early at Southall, and had to stand for several minutes to allow HSTs to pass, before taking the fast line (!) for an excellent run to Didcot. We were allowed nearly 2 hours for our visit to Didcot, so it was just as well there was quite a lot going on! 5051 Drysllwyn Castle was operating trains on the "main line", 1466 propelling an auto trailer up and down the "branch line", and (I think) a 94xx pannier shunting around. I'm sure it was a 94xx class, but didn't make a note of the number. My usual reference source (the aforementioned 7EL) has let me down completely, as it does not show a 94xx at Didcot. As far as I can gather, there are just two in preservation - 9400 at Swindon, and 9466, oddly enough, at Quainton Road. The latter was at Quainton Road when Steve and I passed the site on the "Tame & Thame" railtour in October last year, in steam, but I had not noted its presence, or absence, earlier today. My wife's solution to the problem is simple - "perhaps it's there on its holidays"! We were due to depart at 6.15, so around 5.45 we wandered up to the station to see what was going on. Mostly HSTs in fact, plus the odd class 50 - 50008 "Thunderer" passed on an Oxford train. Departing again dead on time, we headed for home via Oxford, regaining our outward route at Aynho Junction. We now began to make a mockery of the schedule, arriving at Banbury 5 minutes ahead of schedule and departing one minute later, instead of standing for the intended 13 minutes. Leaving Leamington 21 minutes early was a mistake however - it meant we had to stand outside Hatton for many minutes waiting for a Stratford - Leamington train to clear the single line section. Nevertheless, we left Hatton 7 minutes ahead of schedule, and arrived in New Street 8 minutes early, at 8.45. A quick sprint meant we caught the 8.46 to Wolverhampton, enabling us to take liquid refreshment before catching the Euston - Salop back to Telford Central. Conclusions? - another excellent trip with "Black Eight Railtours", despite the revised route. I gained the impression last time that they had booked seats as though the "2+3" seating was "2+2", and the same seemed true of this trip, meaning of course that we had room to spread out and be comfortable! The fare? £12.50, including admission to both preservation sites. Incredible! What's in store for next year, 8F loco society? - We're coming!